When my husband went to Japan for a business trip, some people gave him Japanese confectioneries and snacks. 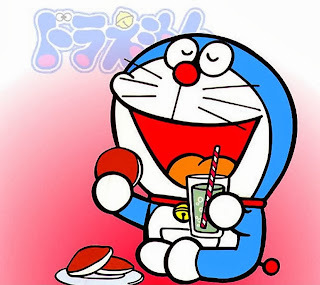 One of them was "Dorayaki (どら焼き)," which is a bean-jam pancake and a Japanese cartoon character Doraemon loves. The Dorayaki he received was not the one I'm used to or familiar with as it says "Mushidora (蒸しどら)" which means steamed pancake. * Traditional ones are baked like regular pancakes. The name of the shop is called "Tae-Asada (妙Asada)" and solely Osaka Takashimaya in Namba, Osaka has this shop. According to the HP of the company, they use fruits to create colorful fillings. One of them has pink pancake with apple paste filling. The other one has yellow pancake with red bean jam filling. There's another filling which is strawberry. Most of the time, the bean paste is red bean, but to use yellowish color from apple, they used white bean paste instead to keep the pale yellow color. This uses regular red bean paste, so the filling was brownish red. I could definitely taste the apple in the filling of the pink one and I hardly tasted bean paste in it. And also I found some apple dices in it. For the yellow one, it was regular red bean paste to me. The pancakes part, it was soft and moist as it's steamed pancake. Regular ones are baked on a griddle, so that it has golden brown on one side and has toasted flavor. But this one was steamed, so that it didn't have much flavor in it. If you'd like to enjoy colorful Japanese confectionery, which you can only get at one shop in Japan, this would work well adding an extra value as it's not nationwide brand. * Japanese confectioneries are usually labeled as "unbaked" so they won't last long. If you're planning to buy this, I recommend you check the expiring date.